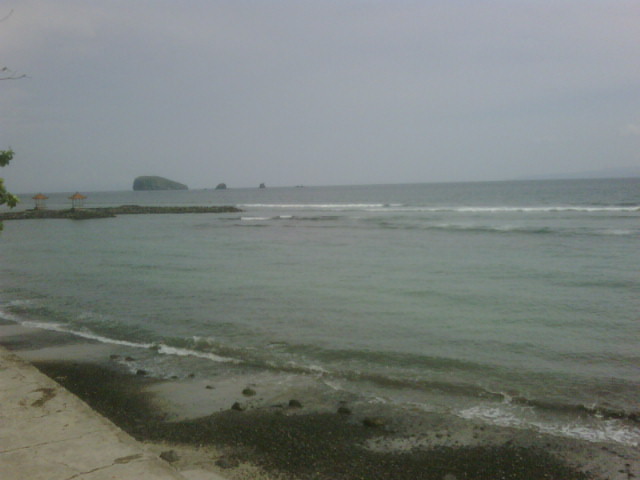 Candidasa is a very quiet place when I visit there in November 2009. Not much tourist I see there. There is no much place to see also, I think..
That time my hotel was located few meters before the entrance gate to Center of Candidasa Street. So I have to walk about 5-10 min to go to nearest Mini Market which is next to Police Station and Perama Bus. That mini market is also small and no aircond there. Feeling like being in a sauna even I am only there for 10 min. There is Lotus Watergarden in center of Candidasa and many café there. One cafe I visited is Iguana, where there is live music twice a week and it is only last till 11pm. The only tourist attraction I visit there is Ujung, it’s like a watergarden castle. The beach in Candidasa is mostly full of rocks. I heard there is a nice beach about 1 hour drive from Candidasa called Pasir Putih which has white sand. I went to Tulamben also where you can dive to see the shipwreck and many interesting underwater life or simply for snorkeling. It’s about 1-2 hours drive from Candidasa. The wave there is very calm in November and very high in July – August. FYI, there is no ATM in Candidasa so you have to go to Padang Bai (Bank BRI) 45min drive or Karangasem (Bank BNI) 15min drive. So make sure you bring enough cash cause I heard not many credit card accepted there.